When a garment or other textile article is damaged in use or in the care process, a determination of the cause can sometimes be made because of the obvious nature of the damage. Other times, garment issues are more complex. When a garment does not withstand the care process, it can result from conditions of wear, storage or transport, from defects in manufacturing, or due to neglect in the care process. Once the cause is identified, responsibility can be assigned to the consumer, manufacturer or drycleaner. The manufacturer is responsible to offer a product that will perform satisfactorily for its normal life expectancy when it is refurbished by the care process specified by the care label instructions. Damage such as severe general color loss and dye bleeding in the care process, shrinkage that makes an item unwearable, color fade from the decomposition of flourescent brighteners, and failure of trim and decorations to withstand the care process are examples of manufacturer responsibility. The consumer is responsible for damage that occurs during use and home care. This includes failure to follow care instructions, further complicating a stain by using a home remedy such as water or soda, chemical damage from spillage of alcoholic beverages, medications, perfumes, after shaves, hair dyes, perspiration and shrinkage of garments due to improper washing techniques. The drycleaner is responsible for damage caused by redeposition of soil in the care process, damage due to improper spot removal procedures, holes or tears caused by mechanical means, damage resulting from articles left in pockets and failure to follow care label instructions. In the rare event that an item is lost or damaged due to neglect on our behalf, we use the Fair Claims Guide in order to determine the adjusted value of the garment based on replacement cost, age, and condition. Every textile product has a “life expectancy” according to its intended purpose, material content and the rate of change in fashion or style. Since an article may retain a degree of usefulness beyond the point of life expectancy, it has some residual value for as long as it remains in useful condition; however, this is usually a minimal monetary value. An article that is rendered un-wearable, or worn out, within or beyond its normal life expectancy, has no value and no negotiable basis for adjustment regardless of the nature of the loss or damage. Sentimental value because of personal attachment is subjective and is ruled out as a valid consideration. 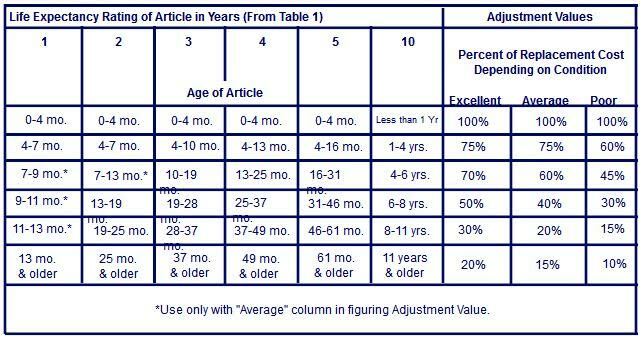 Determine the replacement cost of the article. 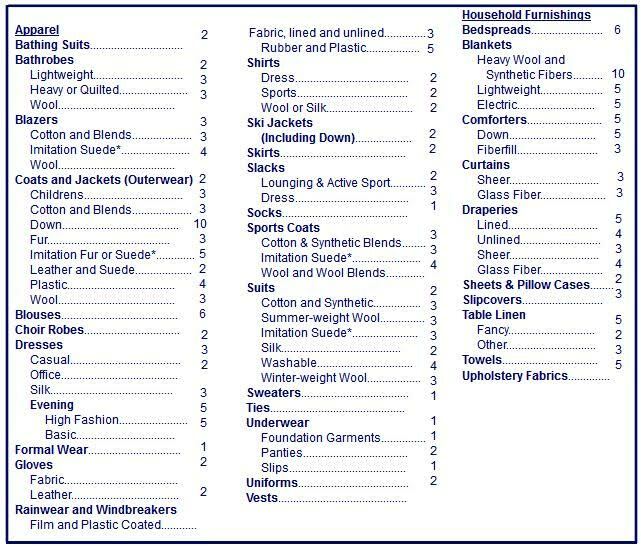 Refer to Table 1 for the type of item and its life expectancy. Refer to the appropriate column in Table 2. Read down the column to the actual age of the article. Read across this line to the adjustment values and choose the value that best describes its condition. Multiply this adjustment value by the replacement cost to determine the adjustment amount. Hangers Cleaners appreciates your interest in our products and services, and your visit to this web site. Your privacy is important to us and we want you to feel comfortable when visiting our site. You may be asked to provide us with personal information on certain pages within our web site. It is your option to provide the information requested. If you give us personal information, that information will be maintained in accordance with the laws of the country in which the web site is maintained. Copyright © 2017, Hangers Cleaners. All Rights Reserved. The text, images, graphics, sound files, animation files, video files and their arrangement on this web site are subject to copyright and other intellectual property protection. These objects may not be copied for commercial use or distribution, nor may these objects be modified or reposted to other web or web sites. This web site also contains images that are subject to the copyright rights of their providers. Unless otherwise indicated, all marks displayed on this web site are subject to the trademark rights of Hangers Cleaners, including each of Oriental Rug Cleaner’s primary product suppliers, their model nameplates, and corporate logos and emblems. In visiting our web site, if you give us personal information in order to receive any type of information in return from us, including a brochure, catalog or information on any Hangers Cleaners product or service, we collect and store that information. Such personal information enables us to fulfill your information request. You should also know that we do not sell any of the information about you that we have collected or stored. This also means that we would not provide it to other companies, marketers, magazines or any other third parties who are not our contractors and who have not signed a confidentiality agreement with Hangers Cleaners. All product illustrations and specifications are based upon current information at the time of programming. Although descriptions are believed correct, complete accuracy cannot be guaranteed. Hangers Cleaners reserve the right to make changes at any time, without notice or obligation, in the information contained on this web site, including and without limitation to prices, incentive programs, specifications, equipment, colors, materials and to change or discontinue products. Unsolicited suggestions, ideas or other submissions to Hangers Cleaners will be treated as non-confidential and nonproprietary. Hangers Cleaners have a specific procedure for receiving and processing all outside suggestion materials. This information is provided by Hangers Cleaners “as is” and without warranty of any kind, expressed or implied, including (but not limited to) any implied warranties of merchantability, fitness for any particular purpose, or non-infringement. While the information provided is believed to be accurate, it may include errors or inaccuracies. All product descriptions and illustrations of products are provided by the manufacturers of the products. Accordingly, by using this information, you agree that Oriental Rug Cleaner (including its subsidiaries, agents, officers, directors, employees and insurers) are not liable for damages of any kind, including (but not limited to) consequential or special damages resulting from your use or access. Hangers Cleaners have sought to achieve an innovative and informative web site. We hope that you will be as enthusiastic as we are about this creative effort. However, you also need to understand that Hangers Cleaners must protect their intellectual property, including patents, trademarks and copyrights. Accordingly, please appreciate that no license to Hangers Cleaners’ intellectual property has been granted by this web site.